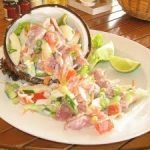 This Tahitian Fish (Poisson Cru) is a ceviche dish that is elevated with the coconut milk. This is straight from our trip to Tahiti. Hope you enjoy it!Note: You can change the number of people served by placing your cursor over "Servings". The Ingredients will adjust to the new number of servings. Cut the fish into 1/2 inch cubes and soak in salted water for 5 minutes. In a salad bowl, mix the diced tomatoes, the finely diced onion, the sliced green onions and the chopped parsley. In another bowl mix the lime juice and the fish, cover and place in refrigerator for 1 hour. With a slotted spoon, transfer the fish to the mixture in the salad bowl, add the coconut milk and mix thoroughly. Note: Do not put the fish back in the refrigerator after the coconut milk has been added.